It’s a party when B.O.B.’s there! 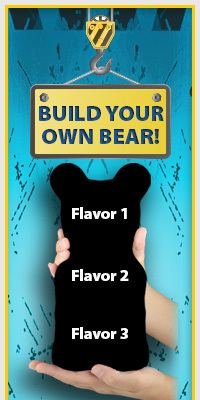 Your guests will love the Herculean size of the ORIGINAL Big Ol’ Bear!™and his colossal taste. B.O.B. is an edible centerpiece and is 17” x 10” x 5.5” (thickness) and approximately 26 pounds. The Big Ol’ Bear!™ has a Belly Bowl that holds 1 liter/34 fluid ounces. Fill it with punch, snacks, or more gummy treats! This made in the USA confection will keep your friends talking long after the party’s over!